John Swinney has announced new guidance for teachers in supporting pupils with additional needs. NEW guidance for schools should help children with additional needs be fully supported in mainstream education, it was claimed today. 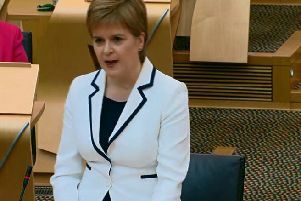 The Scottish Government said that councils and teachers were being given extra help to improve the mainstream school experience for pupils with additional support needs. Clearer guidance on how to decide the best learning environment for young people, including the first definition of inclusion and how it should be delivered, is being given to schools. Online training for teachers on providing additional support to children who need it, has also been developed. However the Scottish Children’s Services Coalition said that more resources were needed to ensure young people with additional support needs (ASN) could remain in mainstream education. It pointed to recent figures which showed an £883 cut in spend per ASN pupil since 2012 and the loss of more than 400 specialist ASN teachers in the same period. There has also been a fall in the number of behaviour support staff, from 180 to 122 and educational psychologists from 411 to 368. “Anything that can support the inclusion of those with ASN in a mainstream environment is to be greatly welcomed," a spokesperson said. "However, the fundamental challenge is one of resourcing. “While we support the presumption that all children and young people be educated in a mainstream educational environment unless exceptional circumstances apply, it is clearly difficult to see how this is functioning properly for all those with ASN given this fall in specialist support and increase in the number of those identified with conditions such as autism and mental health problems. “This has an impact not just on the children with additional needs but every other pupil in the class not to mention teachers who don’t have the additional staff they desperately need. Currently 199,065 young people are identified as having ASN in Scottish schools - 28.7 per cent of all Scottish pupils and Deputy First Minister John Swinney has committed to ensuring teachers have the support they require to help pupils with ASN, without creating undue workload. Mr Swinney said: “All young people deserve the same opportunity to succeed and reach their full potential. Our world-leading approach to inclusion is a key strength of our education system, but we know there is room to improve the experience of inclusion for all children. And, we know that to deliver for pupils, we also have to support teachers and school staff, avoiding undue workload. “Mainstreaming is a central pillar of our inclusive approach to education and the introduction of a Scottish definition of inclusion for the first time reinforces our commitment to Getting it Right for Every Child. But Scottish Labour Education spokesperson Iain Gray said the guidance "ignores the real world of children and families being failed" because of a lack of resources. He added: "All children deserve to be included, engaged and involved in their education. Unless today’s guidance is backed-up with increased resources to undo the cuts to specialist teachers and support staff, then it is no more than warm words. "Labour supports mainstreaming, but the SNP has badly let down the policy’s intentions with their cuts to schools - now £400 million lower in real terms than they were in 2010." Research on the learning experiences of young people with additional support needs has also been published, showing pupils at both mainstream and special schools felt positive about their experience. Almost all pupils felt their needs were well met, and while parents were also positive about the support their children received, many said it had taken a long time to get their child into the right environment. COSLA Spokesperson for Children and Young People, Councillor Stephen McCabe, said: “We are pleased that the research published today shows that many children and young people with ASN and their parents were positive about the support they receive and felt their needs were being met. "COSLA welcomes the publication of revised guidance which aims to support local authorities to work with children, their families and partners to get it right for every child. We will continue the work already in train to build on the good practice that exists across Scotland’s local authorities in supporting children, young people and their families. And Jan Savage, ENABLE Scotland Director of External Affairs, said that its recent campaign gathered the views of more than 800 pupils, parents, teachers and school staff which highlighted the need for guidance that goes beyond the right to be present in a mainstream school to the right to be genuinely included. She added: “We have worked closely with the Scottish Government to develop this new guidance on the presumption of mainstreaming, and warmly welcome its focus on equitable opportunities for every pupil who has a learning disability to participate fully in all aspects of school life.